This entry was posted in Poetry, Weekend Writing Prompt, Writing and tagged creativit, daydreaming, muse, woogathering. Bookmark the permalink. And pfft! Yours is going to rock. I think it’s the layout. Your is vertical, where as mine, when it posts on Tuesday, is horizontal. Do you reckon that’s it? Now we’ll have to wait till Tuesday for an answer on that. True. I read all the other ones (so far) and the horizontal ones do look smaller. My second greatest ideas come up while woolgathering. The first while drinking bourbon. And I would definitely add you. You just haven’t been discovered yet! Wow, this packs such a punch in so little space! Nice. The world belongs to the daydreamers, doesn’t it? Love this. Without the daydreams of such people where would we be and how dull would existence be…if we didn’t perish for lack of dreams. Lovely piece. It does indeed! Sure, movers and shakers get some things done, but I like to think dreamers give us the beauty in the world – as well as the useful and necessary! Eek, I can’t sneeze in 36 words, much less make any sense. Bravo! You funny lady! So then, you are saying I managed to make sense? Oh yeeeeessss. Brilliantly as ever. Chapeau!! Very well done !!! Merci! I appreciate you saying so! My daytime wool gathering seems to garner no ideas whatsoever. Am I doing it wrong? The wandering produced a perfectly presented 36 words in this case! Bravo! What a fun post. Looks like everyone covered it. I just read it after looking at the ceiling for 19 minutes, then saw the sun peek through the curtain. I’ve been summoned to take my dreaming outside. Enjoy your weekend! Thank you, my friend! 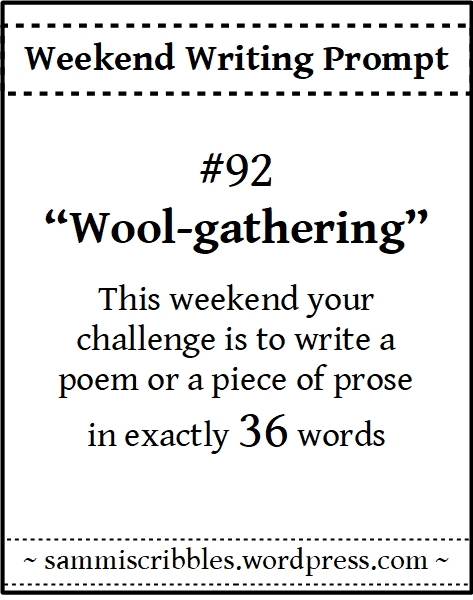 And, was your woolgathering enjoyable, despite being cut short? I love your new Gravatar pic! It was enjoyable! Thank you! My friend took my picture for our new improv team. I can’t imagine how anyone could ever come up with a really original idea, if they didn’t let their mind wonder.. Excellent post Dale. I could not agree more, Violet. Yanno, with most things in life, when it’s cut to the lean it means there is zero flavor to be had. Excepting when it comes to your challenge posts, where few words pack lots of punch. For example, I’ve already exceeded the word count! Your passion for these diminutive ditties is apparent. You love being pushed to find just the right word. And, as per, you have done it again. I really appreciate you chiming in with such positive notes. Glad to find out there is some flavour to these 36 words. I always fear I’ll lose flow or rhythm or sense! Umm . . it’s flavor. And yes to the 36! You went 17 once, so this must have felt like a novel in comparison! I admire your ability to tackle the limbo line the way you do. I would probably just write “All work and no play make Jack a dull boy” until I ran out of words! And. I don’t honestly know how I do it… I search for extra words in places, worry I’ll bugger up my thought, putz around here and there and then finally, close my eyse and release it, hoping I did a half-assed decent job! And you probably would have just one fabulously beautiful sentence. Boom! Boom! And they say Canadians play nice. Pffftt! Half assed decent job? Oh puhleeze! Err, I mean . . 😎 You did a sensational job of it, and it was as a result of working and whittling and re-arranging and knowing the words. No putzing in the recipe. Believe me, I ain’t got the brevity gene. Maybe it’s a result of my Catholic upbringing, I don’t know . . . Course we are. ‘Cept when we talk about ‘Muricans. Well not the ones we love- so you’re good. I know. I’m positive you could do a beautiful 36-word sentence. Buahaha! I do believe that needy writer was looking for a literary hug, yes I do. Imma take your word for it, Ms Lit Limbo. What you got cooking on brevity makes a yummy dish indeed. Yes, yes, she was. She often doubts herself. I think you would (probably already have) write a beautiful one. But of course I am. But, as a divorcée, I am going straight to hell, so there’s that. Wait what? Oh . . you mean like every single writer ever in the history of writing? Hmm. Thirty six words? Gimme another thirty six in the conversion, and then maybe one more thirty six as a gesture of goodwill between our countries and then we have a deal! Meet ya in the fiery pits! Bring marshmallows por favor? I’ll bring the tequila. Yeah, yeah, OK, point taken. One sentence. Just one. 36 words. I know you can do it! Now, I feel I must challenge you. I’ll start with greeting cards and work my way up from there, how’s that? I got the lime, chocolate and graham crackers . . because ‘smores in Hell is the height of irony. We don’t need the hot peppers, because . . yanno! Pfft… ayt. Give it a go. Right. What was I thinking? I wasn’t, that’s what. Ayt, I’ll have to give it a shot. I’m curious my damn self. Yay for muse and yay for dawdling and staring at clouds and letting creativity percolate. Tis’ mandatory, me think! 🙂 Nicely done, my friend! What do you mean? In the sense that I don’t daydream, I do? Bravo ! Let’s have more wool-gathering Dale. Thank you, Francine. Yes, let’s!! Exactly! There’s a lot of value in daydreaming! Definitely! I would even go so far to say it is an essential part of creativity.